I learned quite a bit by tagging along with my mother in fabric stores as a child. (I absolutely loved fabrics with two distinct and usable sides, like crepe back satin!) Touching fabrics is something that we all just get without need for too many words. Unfortunately, tagging around with an expert is unlikely to get you terribly far these days, unless you are lucky enough to be near a very fine fabric store, or if you are very lucky, a museum with a textile collection. The usual chain fabric stores are pretty slim on the variety of fabrics that were used for vintage clothing, or for better modern clothing. 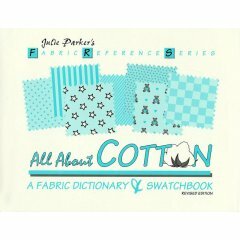 A terrific resource then is a book of fabric swatches, and there is a series of three by Julie Parker: All About Silk: A Fabric Dictionary & Swatchbook (Fabric Reference Series, Volume 1), All About Cotton: A Fabric Dictionary & Swatchbook (Volume 2) and All About Wool: A Fabric Dictionary and Swatchbook (Volume 3). All, Rain City Publishing, Seattle, Washington, in multiple printings. These three books have swatches of the most commonly found fabrics in pure silk, pure wool and pure cotton. There is also a lot of other information, written and printed in an easily digested, enjoyable way. Included is a rating of each fabric for sewing, fit, suggested styles, cost, wearability, suggested care and where to find. These books are pretty costly, about $25 to $35 each, either new or used, yet they are priceless resources for getting to know fabrics. The only drawback that I can find is that these only take a very curious soul so far; if you want to know even more about fabrics, you will need to widen your net. What, for instance, of all the wonderful blends? What of synthetics and rayon? I started my own swatch library, index cards on which I sewed swatches of fabrics when I was absolutely sure I had an example. The collection is pretty large by now. A great find was a 1950 swatch book of Fabrics For Fall (McGreevey, Werring & Howell Co.), 70 pages of good-sized pieces of fabric in a fine array of prints, weaves and fibers, all named. If you can find this sort of book at an antique shop, yard sale, or equivalent, I highly recommend you grab it!